In a place as hot as Bangladesh, most expats want to wear natural fabric like linen (or silk, but silk easily disintegrates). Trying to find 100 percent linen in Bangladesh is much harder than one would imagine. If you ask for “linen” in Bangladesh, the cloth merchants will bring you a linen/polyester blend. What I eventually discovered was that I needed to ask for is “reh-mee-cotton” or possibly “nip-cotton” as that is what they call linen(the “remi-cotton” is “remixed cotton”). Working with my tailor, I finally managed to communicate that I wanted something cotton that felt a certain way (by giving him a sample of other linen pants I had). He successfully brought me a four samples of material and they were indeed 100 percent linen. Samples of 100 percent linen on the table. 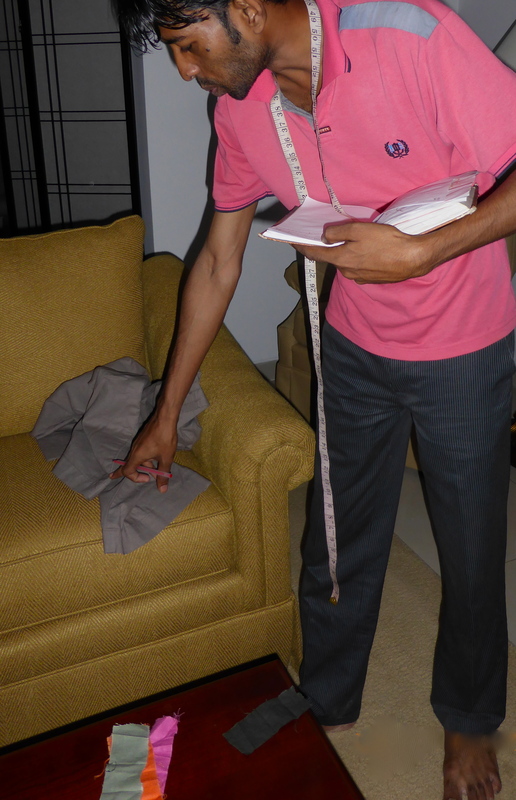 A friend had the men’s tailor shop, Ferdous, make linen pants for her. I was looking for lightweight linen and Tailor Johnny found it. Unfortunately, it was only in a few colors. In the photo, you can see that the four colors on the table: dark green (it looks blackish in the photo but is green), pink, orange, and gray. These are not the usual colors that I would wear. But, I was happy to know that it was possible to find 100 percent linen. Thanks for your interesting comments and fabulous photos! Also love reading about your experiences in other countries. Thanks for you comment, Gail. I will not be in Dhaka when you get there but you will find lots of folks through AISD and other places. Enjoy your adventure in Dhaka! Hi there, I recently landed on your blog and I really like the detailed information you provide for your readers, I have a couple of questions regarding tailor/seamstress. Would you kindly share your e-mail address or (you can shoot me an email if you prefer: sha_rna_1@hotmail.com) – I would really appreciate any help with this matter, thank you! Thank you for commenting nicely about my blog. You are welcome to email me at m@madventures.me or you can just ask your questions here so others can learn from them as well. I want to start a ladies clothing line consisting of Salwar Kameez/Pakistani style long dresses/saris – I have read your post on your preference of tailor Johnny – wondering if he does Salwar suits? If not, would you kindly be able to send me any info as to your knowledge who I can rely on for good quality work but not too pricey as I do have to keep the cost low. I have used a few tailors from Pink City in the past for my personal outfits, although I liked their work but their prices are a bit on the high range and they are already too busy with their existing clients. On a side note: I would be travelling from Canada to Dhaka so it would be nice if this tailor is somewhat tech saavy i.e. can be reached via email etc. but this is not a must ofcourse. I just want to gather as much info as I can before my visit to Dhaka and come prepared. it’s really hard getting info online and i’m glad I stumbled upon your blog 🙂 Thank you once again for your help! Hope you have a good day. I have only had stuff done on a personal basis so I don’t think I can help you much. Everyone in Bangladesh seems to be into some form of business so you could just ask around for help. I think that Tailor Johnny is already too busy to do mass orders and I don’t know if he does email. I think it depends on whether you speak Bangla and whether you want to really spend the time doing the research. In general, I don’t think that most of the tailors in Bangladesh are known for sending shipments but clearly lots of the clothes are sewn in Bangladesh so big companies manage to do this. I think you should talk to as many of your friends in Dhaka and see if they or their family connections can help you. And as always, contact the chamber of commerce. Again, it really depends on if you speak the language and who you know. Have fun there and try talking to folks. Talk to people. By the way, I think Pink City is known for being expensive.